Home to over 70 nationalities and a leading international school in Singapore, Stamford American provides the best start in life for children aged 18 months to 18 years. Here at Stamford American, we believe that there is an opportunity for every child no matter where their passion lies. We are intent on helping each student succeed in their ambition with a personalized approach in a caring, supportive and inclusive academic environment. Stamford American is the first and only school in Singapore to offer multiple graduating pathways. Our students graduate with a US accredited Stamford High School Diploma alongside the opportunity to pursue the International Baccalaureate (IB) Diploma or Advanced Placement (AP) International Diploma that is aligned closely to their ambitions and future university or career plans. As a multicultural, global community of over 70 nationalities, Stamford American’s international culture is supported by our World Language Program, where we offer three of the most spoken languages on the globe: Mandarin, Spanish and English. An extensive range of cultural events such as the International Fiesta organized by our Parent Teacher Association (PTA), Chinese New Year, Deepavali and Christmas are also celebrated here. At Stamford American, we are dedicated in developing and inspiring your child, not just from an academic perspective but also socially, intellectually and physically. Some of the well-rounded programs we offer to drive holistic development include Athletics, Field Studies and Performing Arts. We have two centrally-located campuses that are both easily accessible by train and bus. 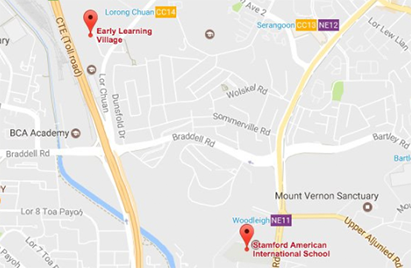 The Early Learning Village which caters for students from Nursery to KG2 is located at Chuan Lane, just 2.6km away from the Woodleigh Main Campus which is dedicated to students from Grade 1 to 12. Stamford American welcomes new families all year round – Book your personal tour today!